At Haldwani, one should load one's cycle onto a bus and journey up to Nainital. From here, a road runs down hill to Bhowali and on to Khairna at the bottom of the hill before ascending to Ranikhet. The road is well wooded and cycling through it gives one the thrill of speed along with the joy of close proximity to he forest. The section from Khairna to Ranikhet is a steep gradient and unless one is anxious to prove a point, it should be covered by bus. Ranikhet, situated on a rolling, forested ridge is excellent cycling country and from here the road takes one downhill for 20-km till it reaches Kosi where one turns off to cycle along the banks of the Kosi River . The Kosi runs through a broad valley with richly cultivated fields on either side till it reaches Someshwar from where one has to climb of about 5-km through densely wooded hillsides of pine and oak till one arrives in Kausani. Kausani gives one a dramatically close-up view of Trishul as well as the snow ranges starting from Panch Chuli in the east, past Nanda Devi, Nanda Ghunti, Kamet and Chaukhamba towards the west. From Kausani one can give the cycle its head and feel it race down the hill, rather like a homing horse, to Baijnath with its thousand year old temples on the banks of the Gomti River . Follow the Gomti River through its beautifully wooded valley till Bageshwar. Bageshwar lies at the bottom of a bowl, and from here onwards all routes involve a steep climb. 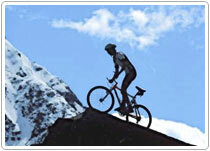 for detailed itineraries on mountain biking in uttaranchal email us at info@himalayanvisit.com.